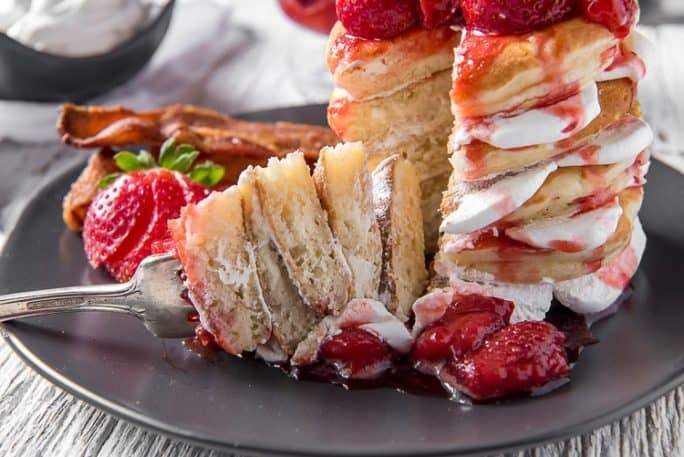 Why not have breakfast and dessert on one plate with a batch of these Strawberry Cheesecake Pancakes! 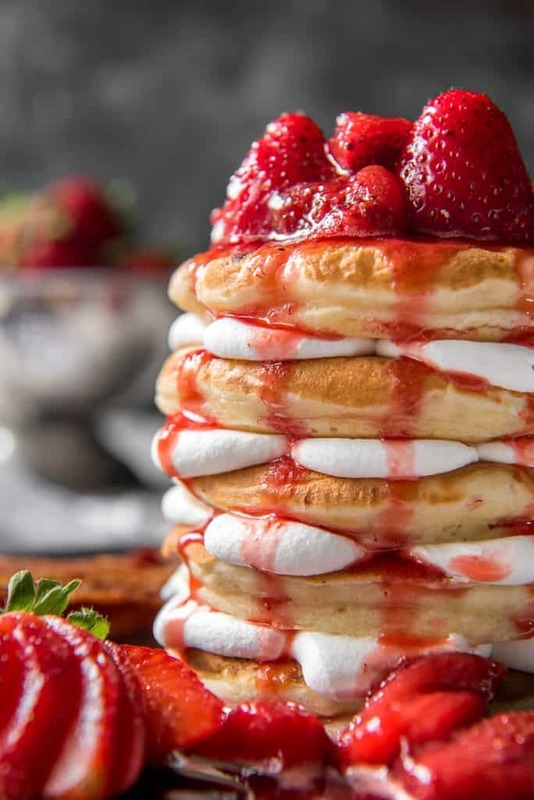 Fluffy cream cheese-stuffed pancakes, whipped cream, and homemade strawberry sauce – they totally blow any restaurant version out of the water with their decadence! So pancakes aren’t exactly a spring exclusive. They sure are a sweet spring break breakfast surprise for someone you love though, right? Whether you’re staying home or shacking up in a B&B on some beach, skip IHOP. Calm your craving for New York cheesecake pancakes and just make these instead. I promise you won’t even miss those sticky diner seats. JUST TAKE ME TO THE STRAWBERRY CHEESECAKE PANCAKES ALREADY! If you’d rather skip my (pretty darn helpful) tips and tricks, essential cooking info, and similar recipe ideas – and get straight to this deliciously easy cheesecake pancake recipe, just scroll right on down to the bottom of the page where you can find the printable recipe card! I have always, always wondered exactly how chefs and pro food stylists get their pancakes so tall and perfect on the sides. Considering how I sometimes struggle even getting my batter to be consistent every time I make pancakes, I’m happy to say that I’ve figured it out! These insanely fluffy pancakes were made possible by #SpringSweetsWeek sponsor Swiss Diamond and their Swedish Pancake Pan! It’s the perfect size to make four sweet-sized pancakes at a time, and super quickly and easily thanks to the non-stick surface of the heavy duty pan. In addition to pancakes, I’ve used it for everything from fried eggs to Mexican sopes. It’s become quite the kitchen staple and I’m totally OK with it. Use the right amount of baking powder. 1 teaspoon per cup of flour in the recipe. And make sure it’s not out of date! Take a look below for an explanation, and what to do if you run out! Don’t over-mix the batter. The only baked good that needs a lot of gluten (the protein created by mixing flour & liquid) is bread. Pancakes, pie dough, cake batter – you want all that to be light, fluffy, and tender. Mix the batter until it’s just combined – some flour lumps are OK.
Let the batter rest. 10 minutes after mixing is all it takes for the magic to happen in your pancake batter. In the meantime, sip your coffee, let the dog out, heat your griddle pan, and get to it! Cook with medium heat. 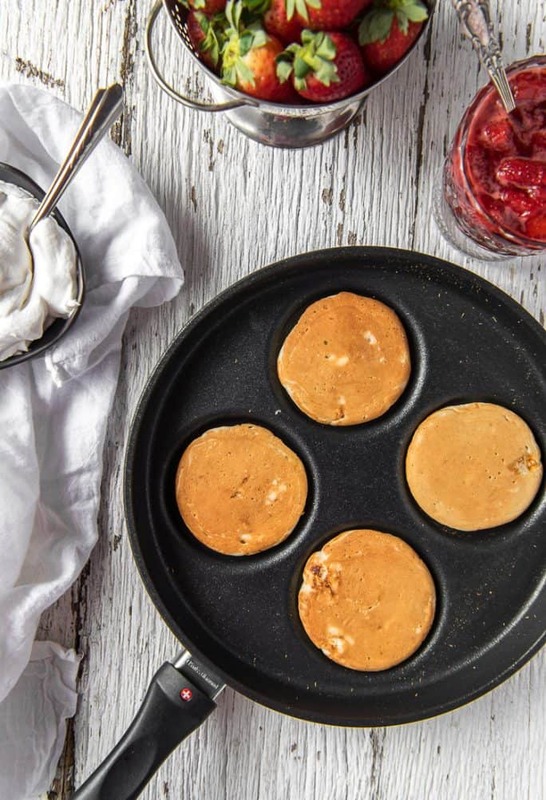 Finding the perfect pancake pan is up to you, but the heat should always be hovering around 5. Test one trial pancake before going all out pouring your batter to make sure the heat is right. Let that first one absorb some of the fat on the cooking surface so the rest will cook perfectly. 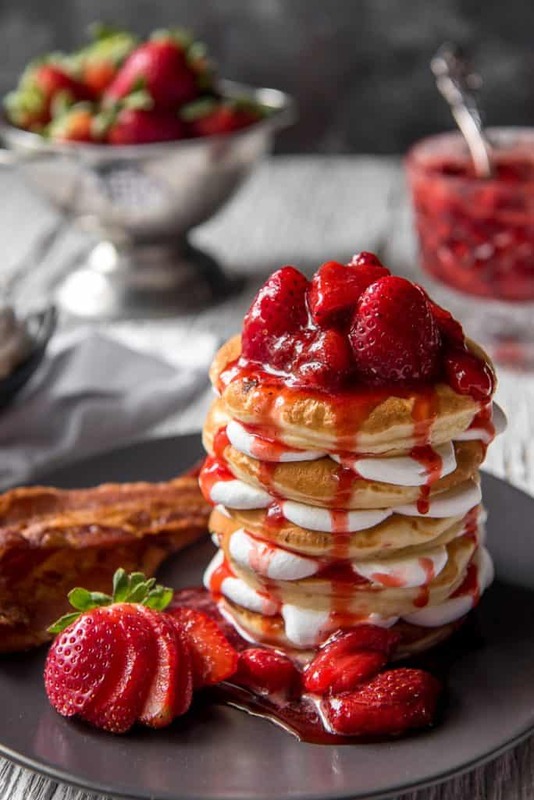 You will find that just about every pancake recipe in the world calls for baking powder – and usually quite a bit of it. Every baked good, even pancakes, requires a carbon dioxide-producing leavener to help it rise. Baking powder in a combination of baking soda, cream of tartar (a dry acid), and sometimes cornstarch. Most baking powders are double acting, meaning they leaven a recipe twice – first when it gets wet, second when it’s exposed to heat. Baking soda is a base that requires a proper ratio of acid (like buttermilk or lemon juice) to cause the same reaction as baking powder. Improper ratios will cause the baking soda to leave a metallic aftertaste in your baked goods. First, mix up your pancake batter. Grab a mixing bowl and whisk together flour, baking powder, and salt. In a separate bowl, use an electric mixer to beat 4 ounces of softened cream cheese and sugar together until smooth. Add the eggs, one at a time, until combined. Beat in buttermilk, melted butter, lemon juice, and vanilla until smooth. Then, gently mix the wet ingredients into the flour mixture until it’s just combined – a few lumps of flour is OK. Add the remaining cubed cream cheese and fold in gently. Allow the batter to rest for 10 minutes. Next, heat a pancake pan or griddle pan over medium heat (or heat an electric griddle to 350 degrees F). Lightly grease with non-stick cooking spray. Pour 1/4 cup of batter per pancake onto the pan, starting in the middle, then swirling around to make a bigger circle. Cook for 2 to 3 minutes until the tops are slightly dry looking, with small air bubbles beginning to form. Flip each pancake and continue cooking on the other side, 1 to 2 minutes, until golden brown. Keep the cooked pancakes warm in a low temperature oven while you cook through the batter. 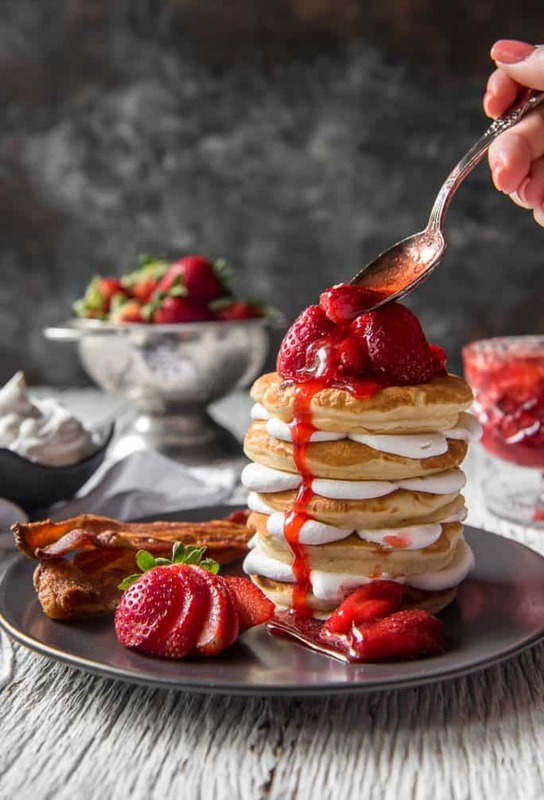 When you’re ready to serve, stack the pancakes with layers of whipped cream & strawberry sauce in between and on top. 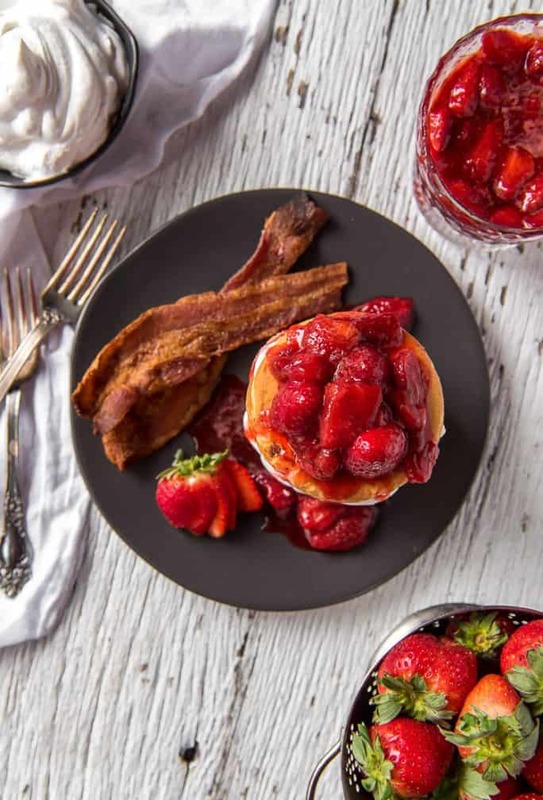 Why not have breakfast and dessert on one plate with a batch of these Strawberry Cheesecake Pancakes! 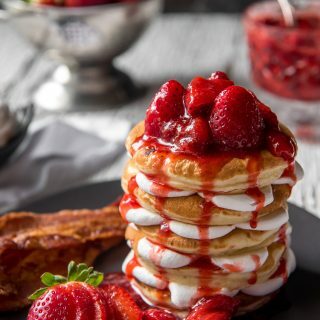 Fluffy cream cheese-stuffed pancakes, whipped cream, and homemade strawberry sauce - they totally blow any restaurant version out of the water with their decadence! Place the strawberries, sugar, and lemon juice in a saucepan set over medium-low heat. Bring to a low boil and cook 12-15 minutes, or until strawberries cook down and thicken. For a smoother sauce, mash the berries with the back of a spoon. Set aside and keep warm. In a separate bowl, use an electric mixer to beat 4 ounces of cream cheese and sugar together until smooth. Add the eggs one at a time until combined, then beat in the buttermilk, melted butter, lemon juice, and vanilla until smooth. Gently fold the wet ingredients into the flour mixture until just combined. Add the remaining cubed cream cheese and fold in gently. Allow the batter to rest for 10 minutes. Heat a pancake pan (or large frying pan or electric griddle) over medium heat. Lightly grease with oil or non-stick cooking spray. Pour 1/4 cup of batter per pancake onto the griddle and cook for 2-3 minutes until tops are slightly dry looking, with small air bubbles beginning to form. Flip, and continue cooking on the other side, 1-2 minutes, until golden brown. Keep pancakes warm in a low temperature oven while you work through the batter. 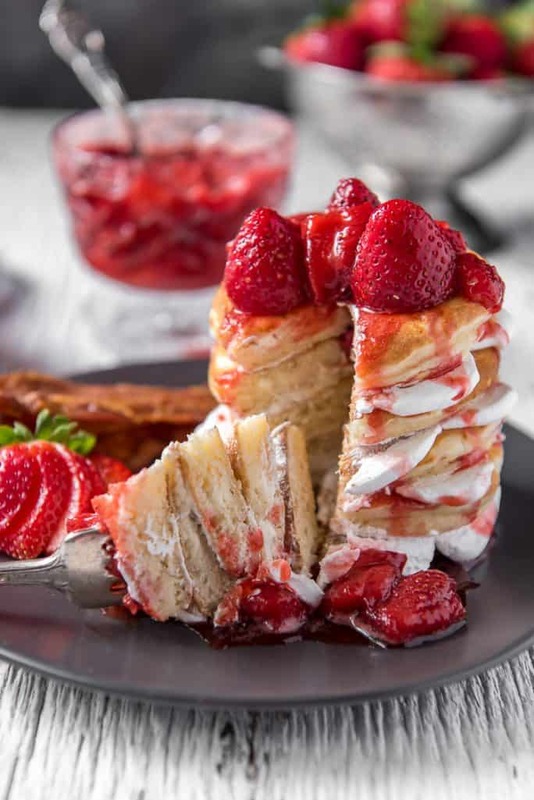 Stack pancakes with layers of whipped cream & strawberry sauce and serve. 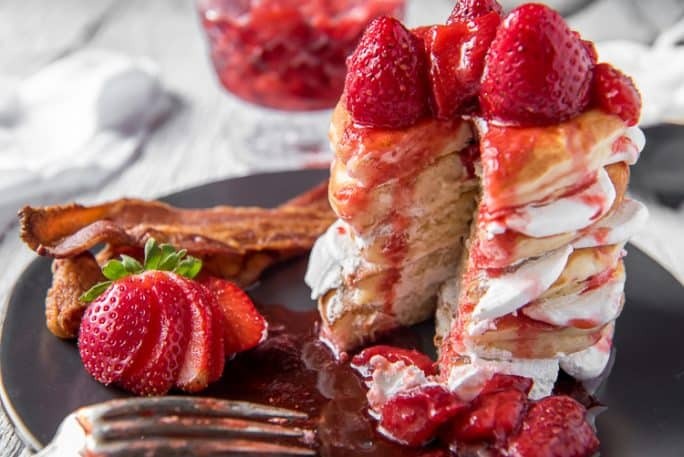 PIN THIS STRAWBERRY CHEESECAKE PANCAKES RECIPE FOR LATER! I had to read that twice that you put the cream cheese IN the batter. I never tried that, it sounds like a winner to me!